Breakfast is quite a hearty affair held on the 5th floor of the hotel. 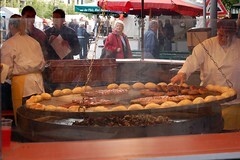 Croissants, breads, cereals, fruit salads, juices, and the ever present boiled eggs, cured meats and cheese. Pots of hot coffee are present on every table and be still my heart, there's real milk too! After a nourishing breakfast it's off for some touring. 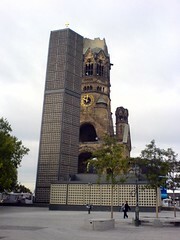 First stop is the Kaiser-Wilhelm-Gedächtniskirche just down from the hotel on the Kurfürstendamm. There's a great etching here that shows you what the church looked like when it was first built in 1895. 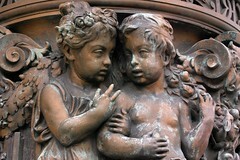 The church was pretty well destroyed during WW2 and was the cause of much debate - should it be pulled down or restored? 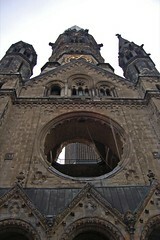 In 1961 a new octagonal-shaped church (designed by Egon Eiermann) was built at its base along with a large bell tower. The new chapel is made from 33000 stained glass panels. From the outside though, it looks unappealing. From here I headed for the U-bahn. 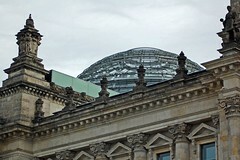 It seemed like the most direct way to visit the Reichstag would be using the underground. I didn't realise how far apart the stations were when I had to switch lines at Potsdamer Platz. 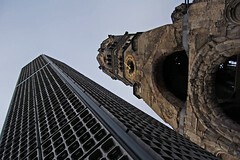 It's also quite an unusual area - what used to be no-man's land during the days of the Berlin Wall, has become the site of a cluster of gleaming highrise, a capitalist playground. It just seems out of place with it's surrounds but when you think about it, this has all been built after the wall fell, in less then 12 years. 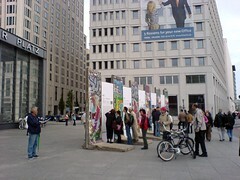 Outside Potsdamer Platz station there are 5 panels of the Berlin wall, still in their original place. You find yourself thinking that it wasn't so long ago that it was impossible to be standing here. 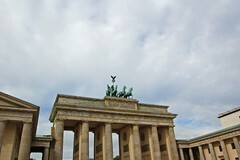 Eventually I did end up at the Brandenburg Gate. 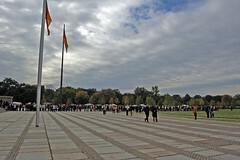 Due to Germany's National Day of Unity on October 3rd, some of the streets around here and the Reichstag are closed and a large festival is taking place. 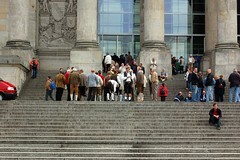 I had planned to visit inside the Reichstag but the queue put that notion on hold. Even guys in lederhosen were in the queue. Being german, I think he's saying I'll have two beers. Until I get inside this will be as close as I get to that dome. In between taking pictures I had a wander along a part of the festival. 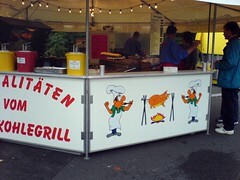 It was mainly full of food stalls and still in preparation mode for the main day. 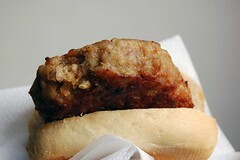 It's not a really big burger, just a small roll. After this I attempted another train journey, this time to see museum island. I say attempted as out of total frustration I threw in the towel and decided to head back to the peace of the hotel. However I further compounded the situation by making a stop at KaDeWe. KaDeWe on a Saturday afternoon - think of the first day of Myer doorbuster stocktake sale without the manners. If they could walk around with their elbows sticking out they would. Prepare to be pushed and walked right over. I collected a very nice set of bruises, easily enough to form a recognisable object if you played join the dots. Today just hasn't left me in a good mood so I'm going to laze around tomorrow, limit my contact with people and just rest.